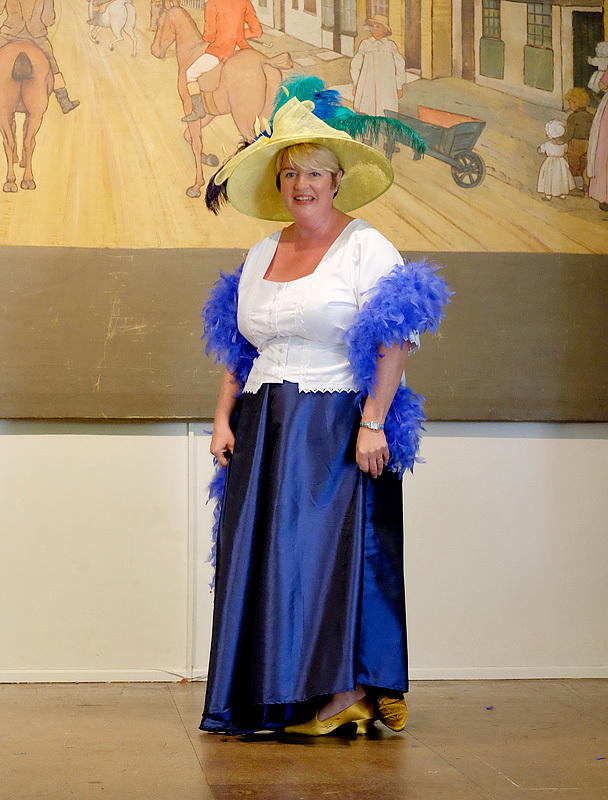 In 2014 the museum marked this important occasion with the exhibition “WW1: The Hadhams on the Home Front”, the event “WW1: The Village Show” and a series of talks including “Warhorse, Being Joey”. 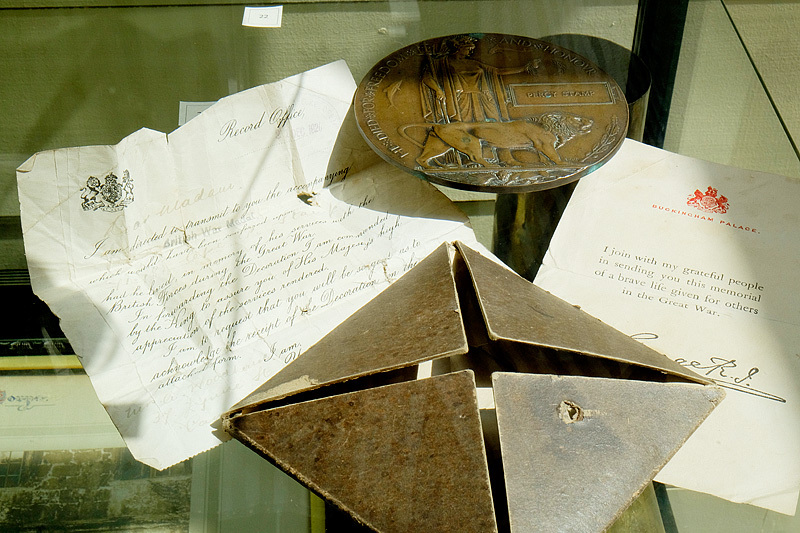 This project was funded by HLF’s WW1 Then and Now programme, which awarded the museum £9750. During the research phase of our project, the contribution from the local community was almost overwhelming. Family stories, photographs and objects flooded in, so much that it was impossible for us to include everything within one exhibition. As a result, we are pleased to announce a second year long exhibition which will focus on the VAD Hospital in Much Hadham, the stories of the nurses and the soldiers who convalesced here. The starting point for this research is the hospital’s guest books, now held at the Imperial War Museum archive. 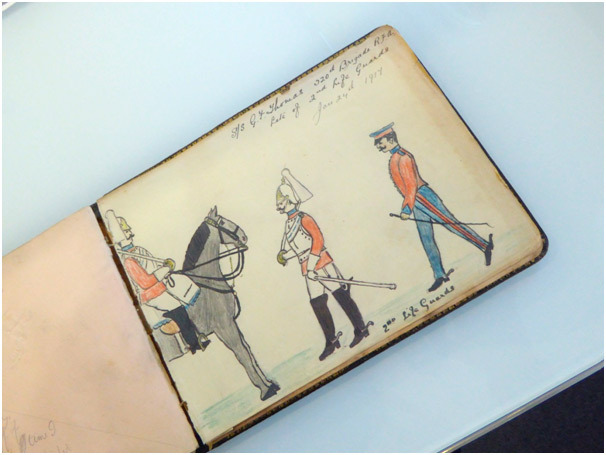 These books contain messages, sketches and poems written by the soldiers during their stay. After a very long wait, our museum volunteers have now photographed the books and are currently listing all the soldiers and collating any documentation that can be sourced to tell their stories. If you would like to get involved in this fascinating project, please use the “Contact Us” form on our website to get in touch, www.hadhammuseum.org.uk. WW1 Commemoration – thank you! It has taken a year’s planning and a tremendous amount of research and coordination to bring you the fascinating stories of our local people and the contribution our communities made. 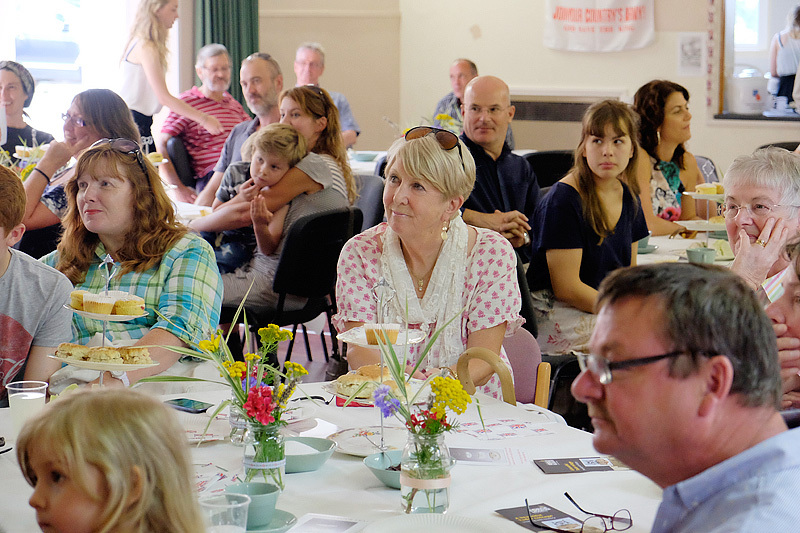 Over 300 people turned out on 3rd August to support our event. 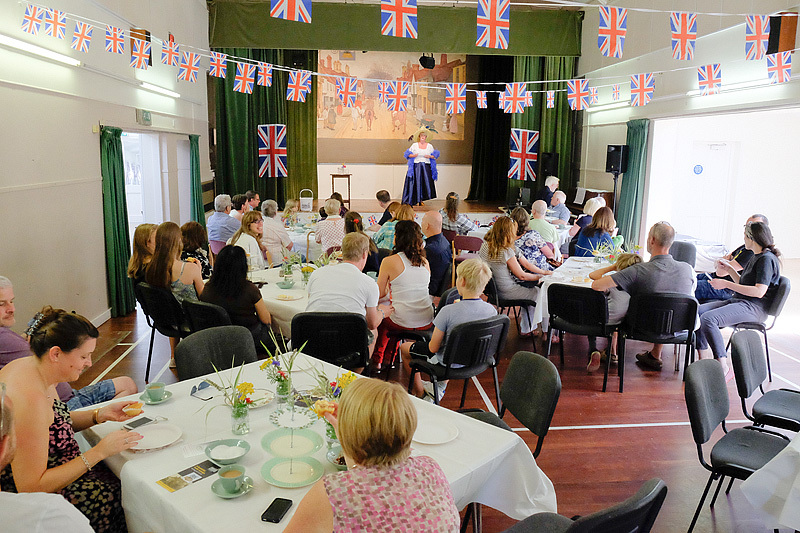 After visiting the “Secret Cinema” in The Green Room and enjoying a vintage tea, our audiences were entertained by a wonderful soundscape, curated by Nicholas Jardine. 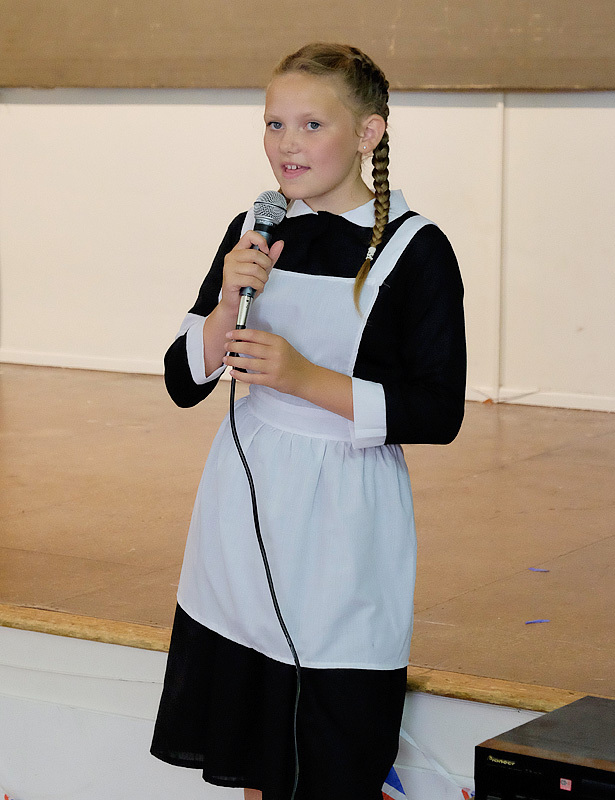 The music really set the scene and highlights of the day included performances by Elaine Walsh and Leah Miles. 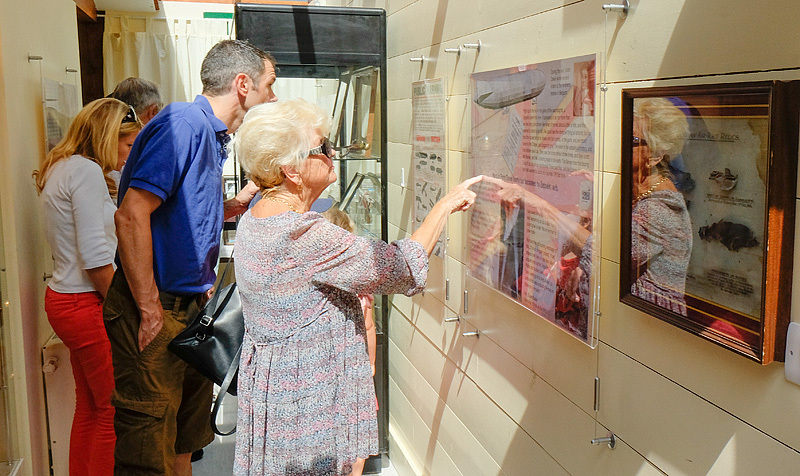 The Exhibition, which will remain on display at the museum until December 14th, uses a wide range of objects and photographs both from the museum collection and local people to tell the story of life in The Hadhams during The Great War. The display includes artwork by Years 5 and 6 from St. Andrew’s School and we look forward to continuing to work with them next year. We were delighted with all the positive feedback on the day and we would like to say a huge thank you to all the museum volunteers and local people who have taken part so far. It was wonderful support to have our 6th form volunteer team, under the guidance of Waitrose staff in the kitchens! It does not stop here, the exhibition and wider project continues to grow and we will be bringing more events and activities over the coming months. All photographs © Copyright David Calvert 2014. All rights reserved. We are delighted to announce that the schedule for Arts Award Week Explore (22nd-26th July) is confirmed! Highlights of the action packed week include a day with Showtime Stitches and a private guided tour of the Moore Rodin exhibition. There are only 4 places left, so don’t delay, book yours today! 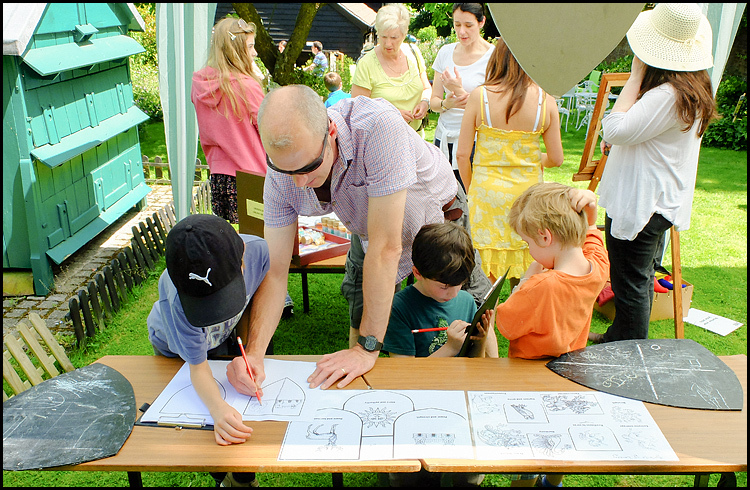 22nd July: Day 1: Introduction to Arts Award and Creating your own Arts Map. 23rd July: Day 2: Artist-in day with the very talented Megan Doyle of Showtime Stitches. 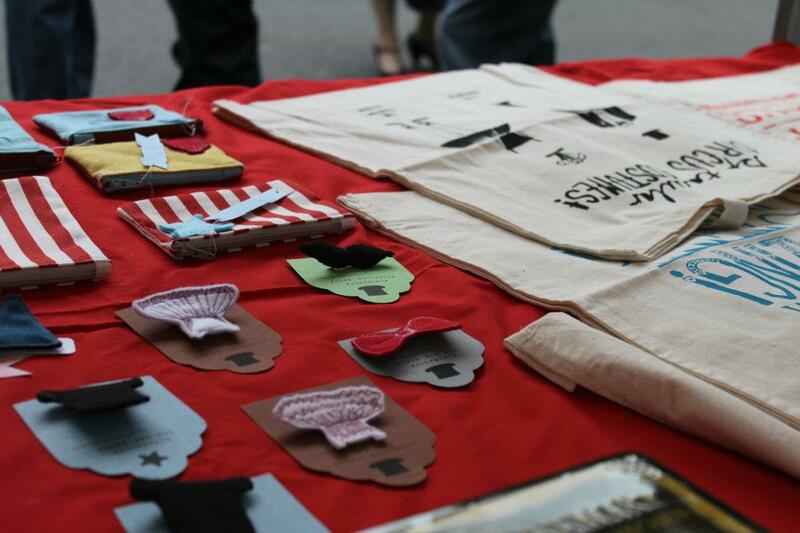 London School of Fashion student and designer Megan will take you through the process of designing and printing your own tote bag. 24th July: Day 3: The Curator’s tour of the museum galleries, with an emphasis on art forms expressed within the museum collections, followed by a session on having an artistic response to art. 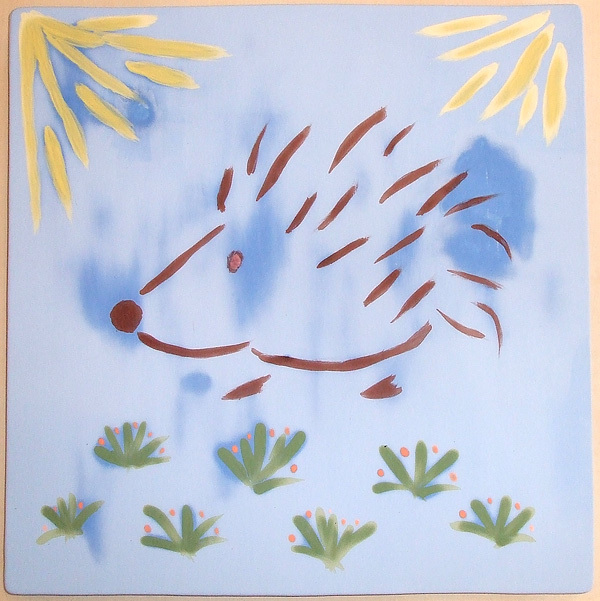 In the afternoon, you will have time to produce your own artwork inspired by the museum collections. 25th July: Day 4: A guided tour of the Henry Moore Foundation’s “Moore Rodin” Exhibition followed by a tour of Moore’s studios to see how he worked and the galleries to see the range of his work. In the afternoon we will explore and sketch and there will be time to produce your own postcard artwork for the Red Cube Gallery. 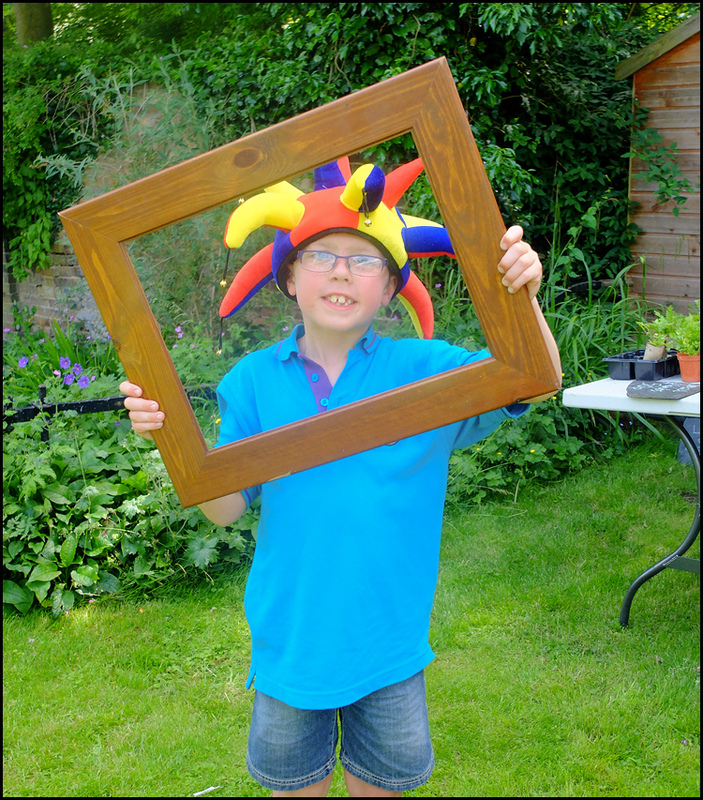 26th July: Day 5: Creating and documenting your own artwork in response to the week, which could be the spoken word, a poem, creative writing, a sculpture, a drawing, a painting or cartoon etc. During the afternoon, you will promote your week’s work (e.g. exhibition poster, tweet, press release, online blog) and present your work as a collective display with the rest of the group. 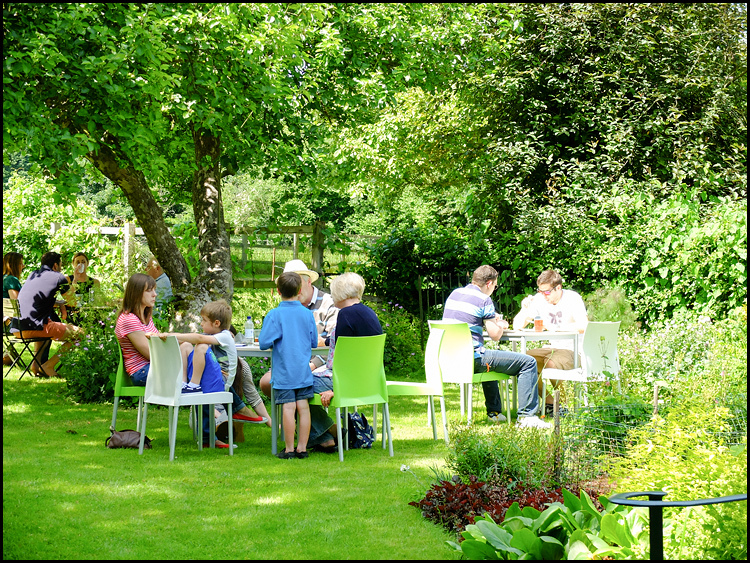 We were blessed with beautiful weather for our party and everyone made full use of the garden to sit and enjoy the sunshine. Amidst much chatter, the ring of hammer on anvil could be heard in between the Tudor songs as our resident blacksmith was working in the forge for the visitors to watch. In the museum visitors could view a display of Tudor artefacts from our collection, found and donated in the main by local metal detectorists alongside replica clothing made by Isabella, a local student earning her Duke of Edinburgh award. We also conducted hourly House Tours to see the fabulous Elizabethan wall paintings within Forge House. The visitors were stunned to see Gloriana herself portrayed a King Solomon in the Old Testament story The Judgement of Solomon, dating to 1576, just one of the four wall paintings in the room. 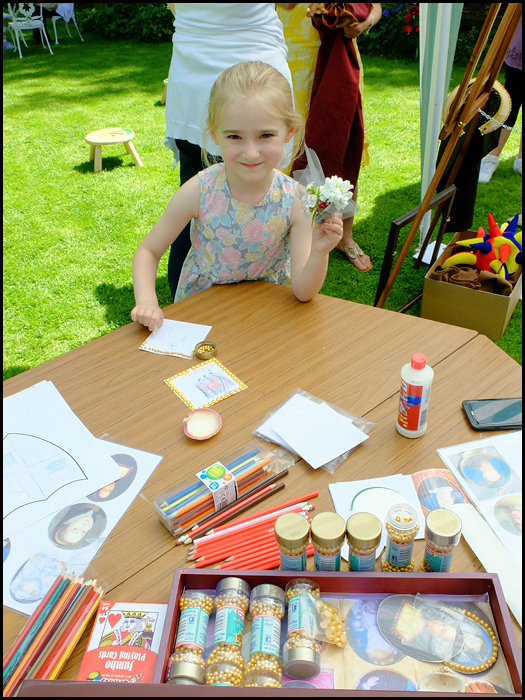 Children and adults alike took part in the crafts and activities available, from designing your own coat of arms to making a Tudor miniature or dressing up to pose for your own Tudor portrait. Sweet smells filled the air from the Herb Kitchen where you could make a nosegay filled with herbs and flowers. The museum kitchen served an Elizabethan-inspired menu of lunch and cakes, all delicious! 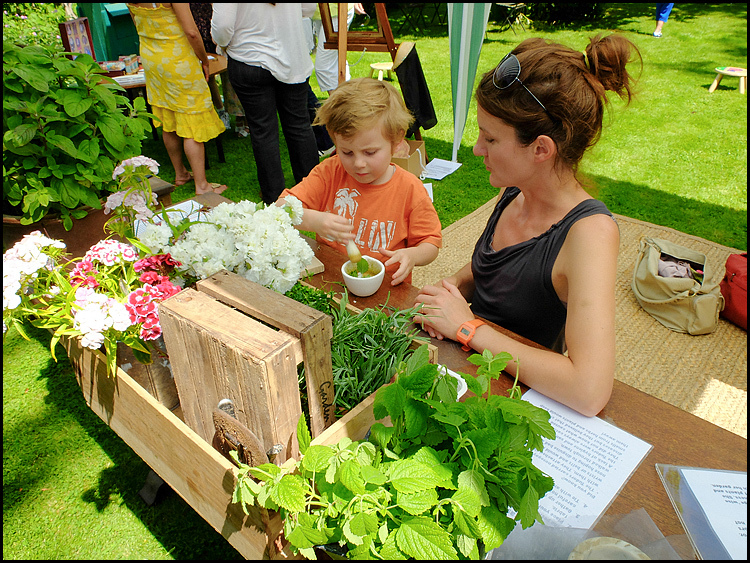 The bar served wine, locally brewed ale and apple juice made from the tree in the museum garden. A big highlight for us was that Matthew Ward from Horrible Histories came along to join in the fun! Huge thanks to volunteers Elaine and Nollie who put in so much time and effort to make the party a success and of course to all those of you who came along to support us. It was a beautiful day with a lovely relaxed atmosphere, perfect for absorbing all the history around us. Hello, my name is Gabriella, and I’ve just undertaken some work experience at the museum. My week at the Museum has been a week that I will remember for a long time, not only for the Tudor music CD on repeat but for the people I have met and the experiences I have had. The volunteers and staff have been welcoming and a pleasure to work with. Not really knowing what to expect from my week, I was surprised when my first task was to buy art supplies for an upcoming event. I was delighted as I have some experience in spending money and enjoy it. The money was soon spent and the day had come to an end. At the end of the first day all my nerves which had been there in the morning had disappeared by the friendly nature of the staff. On Wednesday a group of 45 people came to visit the museum, as this was a lot of people a lot of help was needed. The volunteers were friendly and easy to work with, helping me whenever I needed it. I got the chance to talk to the visitors and see what they enjoyed about the museum and their opinions on the different sections of their visit. I attended a meeting with a local primary school head teacher about an upcoming project the day after. At first I was nervous about how to act in a meeting, however I soon settled in. The enthusiasm surrounding the project was exciting and the ideas for the project sounded fantastic and I wish the museum and the school luck with this project and the brilliant ideas within the project. On my last day I was to help prepare for the museum’s Elizabethan party by making labels for herbs and organising the music for the event. I would like to thank the Curator of the museum, Cristina Harrison and the volunteers for an enjoyable week and an unforgettable experience at the museum. 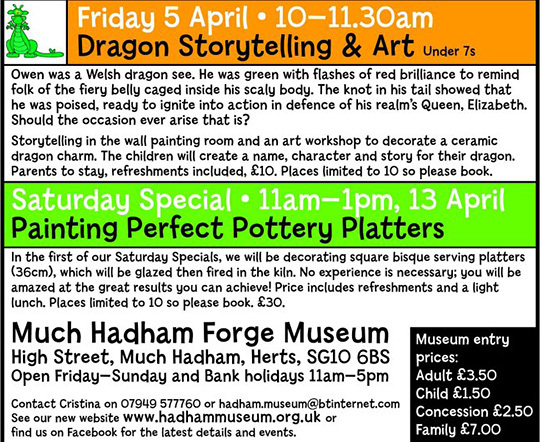 The Forge Museum Opens Friday 5th April! 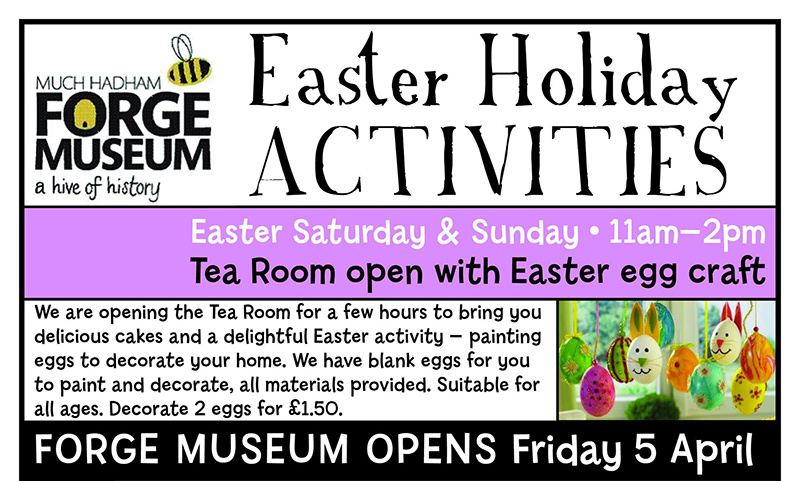 We are opening the Tea Room for a few hours to bring you delicious cakes and a delightful activity – painting eggs to decorate your home. 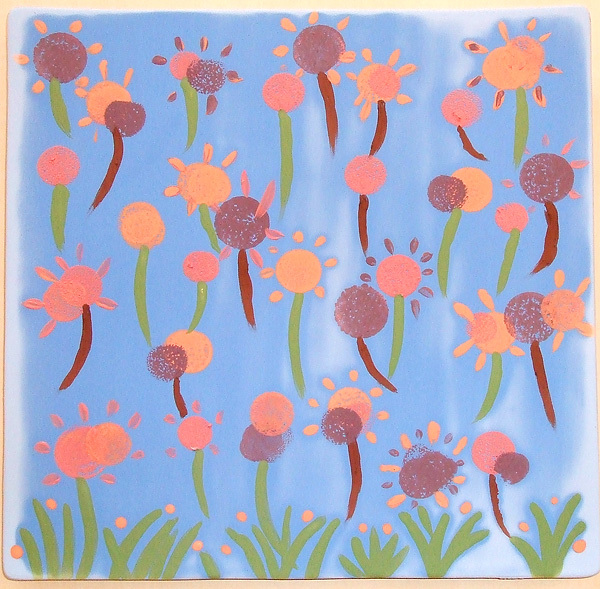 We have blank eggs for you to paint and decorate, all materials provided. Suitable for all ages. Decorate 2 eggs for £1.50! 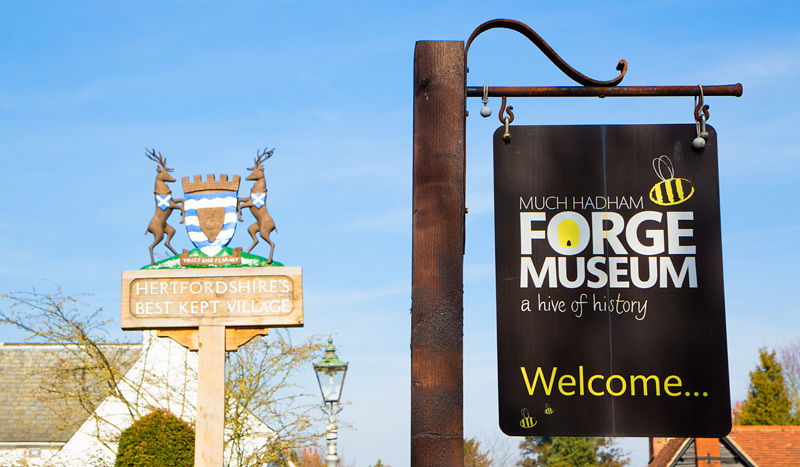 We will soon be adding posts of what’s happening here at the Forge Museum, so be sure to come back soon.